This morning’s private lesson saw my two junior clients grow their combinations, focus more on the L and V-Step as well as develop the uppercut and the liver-shot/shovel hook. We warmed up with partner work, focusing on defensive attributes using footwork and slipping. Here I principally addressed the L and V-step. The L-step is a great defensive and drawing technique, but it only works to one side of a stance. The move is used to move out of an opponent’s firing line before shifting abruptly out to the side. This footwork is achieved by drawing the front leg back in a straight line and then moving laterally with the back leg leading. It creates an L-shape on the floor. The V-step is a shallower but more versatile move. It can be used in various ways and is often simply referred to as angling off. The V-step nicely crosses into various other stand-up methods of fighting. After getting on the pads and working up to the 11 punch combination, where we brought in the lead hand uppercut. This comes in at the 6 punch combination mark – it is the number 5 punch. 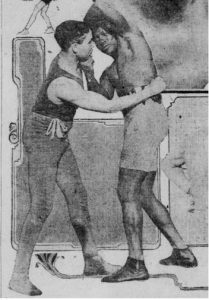 The technique was isolated in its three lead hand forms: close, mid and as a variation on the jab. The liver shot was introduced off the v-step. This tactic is used to expose an opponent’s right hand side when fighting an orthodox boxer. The fighter angles off and throws the liver shot as the opponent adjusts to the new position. This is often set up with a combination to the head.